Week 1 of the 2018 season brought in an up-and-coming team that was partially constructed by former NYG Head Coach Tom Coughlin. The Jacksonville Jaguars, in their first game since losing to the New England Patriots in the AFC Championship, entered MetLife Stadium ready to wreck havoc on a shoddy offensive line. That they did on the first drive of the game that resulted in a near-safety on two separate occasions. It was a sign of things to come, as the JAC front seven controlled the game and heavily impacted the NYG approach on offense. The JAC offense is very dependent on Leonard Fournette and their power rushing attack. They hit a groove early on paired with some solid gains on play-action and bootleg passing plays. The misdirection seemed to take advantage of the over-aggressive, new NYG defensive scheme. The two teams traded field goals but JAC took a couple steps forward in the 2nd quarter, scoring 10 straight points which got them a 13-3 lead. 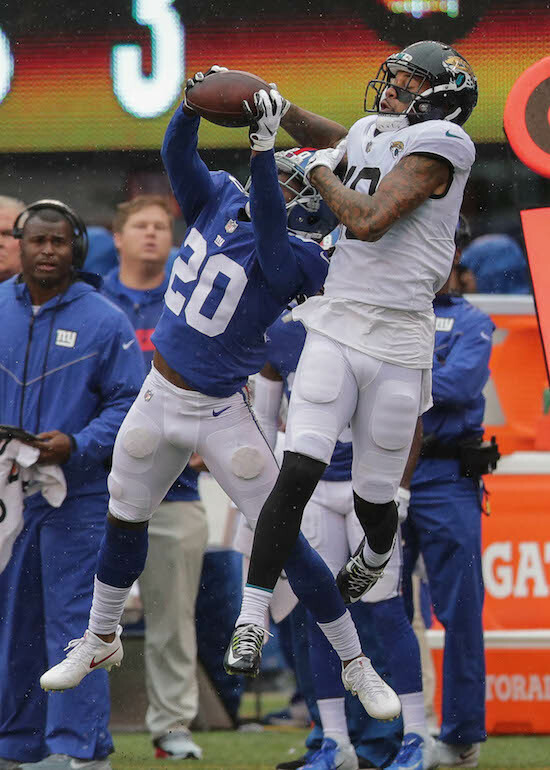 However thanks to the grabby-defensive backfield and the fear Odell Beckham strikes in to the opposition, 45 yards worth of penalties put NYG in prime field goal position to net them another 3 points, ending the half down 13-6 but with possession at the start of the second half and JAC without Fournette because of a hamstring strain. NYG began the third quarter with a back and forth approach. Saquon Barkley, after a quiet first half, started to show why this team made him the 2nd pick of the draft. But mental mistakes by Evan Engram and poor play in the trenches kept on pulling the offense back just enough to make them settle on a field goal. The rest of the 3rd quarter was a back and forth affair that played exactly into what JAC wants: a moving clock paired with a field position battle while in the lead. The action picked up in the 4th quarter. Manning started to feel some extra urgency and made a throw he shouldn’t have while under pressure. This resulted in a interception by Myles Jack which he easily returned for a touchdown. NYG was down 20-6 with 11 minutes left. The team needed a spark, badly. Enter in Barkley. A couple broken tackles and a sprint down the sideline netted NYG their first touchdown of the year, a 68-yard score by the rookie. They came up 1 foot short on the 2 point conversion, however, leaving them in a touchdown-or bust situation. The energy was back in the stands and after a 3-and-out by JAC. However, NYG responded with a 3-and out of their own. Their next possession put them into JAC territory after 2 passes to Odell Beckham. But the right side of the offensive line disrupted Manning just enough to misfire on two occasions paired with a drop by Sterling Shepard. They turned the ball over on downs but stopped JAC 3 straight times while burning their final timeouts, leaving them with under 1 minute to score a touchdown from their own territory. But the effort was never made, as PR Kaelin Clay muffed the punt and JAC recovered. Eli Manning: 23/37 – 224 yards – 0 TD/1 INT. Manning started off 11 for 11 despite having the Jacksonville pass rush in his face nearly every time he reached the end of his drop back. Manning delivered a lot of throws under duress. I watched 6 NFL games from yesterday and only Russell Wilson saw more consistent pressure. And Manning’s disadvantage there is that he doesn’t move well anymore in space. Good footwork in the pocket, but he just isn’t a very good athlete. Manning also had two overthrows on potential touchdowns in addition to a poor decision to throw a ball under pressure that ended up being tipped and returned for a pick 6 in the 4th quarter. Saquon Barkley: 18 att / 106 yards – 1 TD – 2 rec / 22 yards. A lot can be said about Barkley’s first game against arguably the best front seven in the NFL. His game started off slow, as he was forced into re-routing prior to reaching the line of scrimmage 6 of his first 8 attempts. But once the second half rolled around, he found a groove and we started to see the physical ability shine bright. He looked more confident and decisive. In the second half, Barkley ran the ball 10 times for 94 yards including a 68-yard touchdown that brought the team back to life. That run included 2 broken tackles and an all out sprint to the end zone (thanks to a key block by Sterling Shepard) that outran the entire JAC defense. There aren’t many backs in the league that could have pulled that one off. There were two negatives in his debut and they both centered around Barkley not taking what this defense gave him. Against a front seven like JAC, there needs to be more north-south thought process on runs between the guards. -Jonathan Stewart and Wayne Gallman spelled Barkley a few times. After a tortoise-like preseason, Stewart actually had a couple of solid 4-yard runs. Nothing to get excited about but after what we saw in August, it is a step in the right direction. This team is going to cap how many touches Barkley gets weekly, especially early in the year, so Stewart needs to give NYG more of those 4-yard runs. Gallman left the game with a knee injury that isn’t expected to be serious. Shane Smith saw limited snaps but he was a factor. With this OL and Engram struggling to get movement at the point of attack, Smith may need to be in the game more often. -Odell Beckham: 11 rec – 111 yards. I won’t say I forgot how much Beckham changed the outlook of this offense, but it was a refreshing sight to see #13 out there getting open on all levels whenever he wanted to and wrecking havoc on the Jaguars defensive backfield. He also forced 45 yards worth of pass interference penalties that stemmed from him running great routes. He took a couple of big hits in this one and he fired himself right back up and seemed to enjoy it. That is what this offense needs out of him. If Manning had made a better throw, he would have had 33 yard touchdown in the 3rd quarter as he got behind the secondary in a blink. -Sterling Shepard: 5 rec – 48 yards. Shepard had a drop in the 4th quarter that really hurt the team’s attempt at pulling off a major fourth quarter comeback. Otherwise he ran excellent routes and showed the usual toughness in traffic. His downfield block on the Barkley touchdown was vital. He is going to be an important piece because of how consistently he can run himself open underneath. I would like to see more after the catch, however. -Cory Latimer didn’t receive any targets. For a “starting” wide receiver, many will be disappointed. But on this team, he is the #5 receiving option at best when everyone is healthy. Don’t expect big impact plays on any sort of consistent basis. -Evan Engram: 2 rec – 18 yards. Really rough outing for the second year pass catcher who missed some time with a concussion during the preseason. Engram has somewhat struggled with drops in his young career, and he only added to that in this one. He had 2 drops, a pass interference penalty, and allowed a tackle for loss. Engram was mauled at the point of attack against the JAC defensive linemen. His overall blocking grade was the worst he’s had since being a Giant. While I don’t want to bash him considering what he is to this team and who he was matched up against, he simply needs to be better. For a team that will rely on the running game and a team that may need to help the RT up front, Engram can’t just be a receiver. Effort was there, impact was not. -Rhett Ellison was in to run block and I can’t say he made a major difference. He caught one pass against a prevent defense. Scott Simonson was in for 4 offensive plays and allowed a pressure. -Nate Solder had a rough first game in blue. While he provides more confidence and security than what NYG has had in recent years, he was outclassed by the JAC defensive line. He allowed 1 TFL, 2 pressures, and committed a holding penalty. He also struggled to get movement as a run blocker. This is the kind of defense that has always given him some trouble, power and size based. -Ereck Flowers took a step back towards one of the worst grades of his career. 2 penalties, 1 TFL, 3 pressures, and 1 sack. Flowers also failed to reach his assignment on 3 separate down blocks. This would be a damning game for a rookie. The shift to right tackle didn’t hide is ongoing issues of poor footwork and even worse hand placement. The one positive was a very solid block on the Barkley touchdown. It is going to be a long year on the right edge. -Chad Wheeler saw some action as a blocking tight end. I think we will see more and more of that, although he didn’t perform well. He was in for 3 plays and he too allowed a TFL. And no, he is not a suitable replacement for Flowers. -Will Hernandez had a couple of “Welcome to the NFL, kid” moments. He allowed a TFL to Malik Jackson on the first drive and sack to Calais Campbell on the fourth drive. He had the most positive grades in the game among the OL, most notably for his ability to move guys at the point of attack. He does a nice job when it is straightforward run blocking but he will need to learn to adjust to the quickness of NFL defensive tackles. Can’t expect much better from him, but you just want to see progress as the year progresses. And I don’t think he will have many, if any, tougher assignments than what JAC presented. -Patrick Omameh and Jon Halapio didn’t stand out in a negative way. They both allowed 1 pressure each but weren’t on the radar much other than that. The issue was just a lack of difference making movement. The interior of the JAC defense went where they wanted to. It’s pretty bad that these two had the best grades of the OL, because by no means were they above average or even close to it. -With Olivier Vernon out, it meant Connor Barwin and Kareem Martin were going to see the majority snaps. Martin finished with a half-sack and 3 tackles while Barwin had 1 pressure and a big pass deflection in the 4th quarter. But when it came to the situations where a pass rush was really needed, they didn’t come through. -Kerry Wynn and Lorenzo Carter rotated in and both had a similar impact to the starters in less playing time. Carter had a pressure and pass deflection while Wynn recorded a half-sack. I think this pass rush is better with these two in the fold, as their ability just has more potential. Martin and Barwin will scare nobody on 3rd down. -Damon Harrison played 71% of the snaps, more than I was anticipating. He went down with a minor knee injury in the second half but it didn’t keep him out long. He dominated the inside gaps, finishing with a TFL and 6 tackles. He was in on sure-passing downs more than I expected to see and I like it, his bull rush is as good as anyone’s and it helps the complex blitzing schemes. -The young sidekicks, B.J. Hill and Dalvin Tomlinson were solid but unspectacular. The combined for a solid 9 tackles and showed good pursuit and effort. But JAC was running the ball with ease in the first half, as they struggled to hold ground on lateral runs. These two are very solid and will be good, but it was notable to see the difference between them and the JAC defensive line. Different class. -Newly signed Mario Edwards and Jordan Jenkins played sparingly without much impact. Edwards did record 2 tackles on just 6 snaps, however. He looks athletic and rangy for his size. -New defensive captain Alec Ogletree tied for the team lead 7 tackles. He was solid between the tackles and better in coverage than what we saw in preseason. The middle of the field, however, is still a weakness against the pass and he is a part of it. He allowed a touchdown that was negated by a JAC penalty. -B.J. Goodson started, but he and Ray-Ray Armstrong split snaps. Goodson struggled to scrape over the top, often late to recognize and putting the blocker in a position to wash him out. Armstrong is a much better athlete and reacts with more speed. Both were fooled by all of the misdirection JAC threw their way, however. -One of the best overall games we have seen out of Eli Apple in his 3rd-year career. 3 tackles and 2 pass break ups along with some very good deep coverage. While it wasn’t the best air attack he will be matched up against this season, Apple did his job. We haven’t been able to say that in awhile and if this talent-rich first rounder can show consistency, the outlook of this defense is very different. -Janoris Jenkins was up and down. The playmaker came up with a 1st quarter interception and a very high-level pass break up in the 2nd quarter. He allowed 2 of the 3 biggest gains in the passing game that JAC had. He also had 7 tackles, tied for the team lead. -B.W. Webb was the nickel back, playing in just over 50% of the snaps. He looked afraid of getting beat deep and allowed too much underneath. He allowed 2 catches for first down on situations where he needed to be up on the receiver more. -Landon Collins had an up and down game. I was interested to see his role in this new defense and it actually wasn’t very different than last year. He roams a lot and they trust him to make the right decisions. He had 5 tackles and a high-level pass break up but got lost in traffic on the T.J. Yeldon 15 yard run that brought JAC to the 1-yard line. Collins was also the guilty culprit on Blake Bortles career long 41 yard run on a naked bootleg. That was a designed run and JAC knew Collins would react that way. Not a good sign. That was one of a few situations where his eye discipline was non-existent. He is a high-risk, high-reward player. -Curtis Riley was solid in his debut after winning the job in camp. He had 5 tackles, 1 of which on special teams, and a couple of fast and physical downhill hits. He also fulfilled his deep coverage responsibilities on two plays where Bortles wanted to go downfield but chose not to. Michael Thomas played sparingly, allowing a catch for first down but also pressuring Bortles and making a big hit on 3rd down that caused a near-fumble. K Aldrick Rosas: 3/3 (Made 27-31-44). Very solid day for Rosas in both departments. P Curtis Riley: 5 punts – 49.4 avg / 43.4 net. Solid numbers but his worst punt of the day started off the lone JAC offensive touchdown. PR Kaelin Clay had a quiet game until the very end, in a bad way. He misjudged the depth of a punt and muffed it, turning the ball over to JAC with under a minute left leaving NYG without a chance at one last attempt to win the game. -LB Myles Jack was my top graded player in the 2016 NFL Draft. The knee issues bumped him down just a tad, but now that he is in his third year, I think we are looking a potential Defensive Player of the Year candidate. There may not be a faster LB in the game, as he covers WRs in space and ran with Barkley stride for stride on the long touchdown. But at the same time this guy is a terror to deal with between the tackles. His game-leading 10 tackles and pick six don’t even tell the story of how much he impacted this game. -The JAC defensive line might be the best in football when considering the depth. Only LAR can hang with these guys. It is a good thing knowing NYG won’t be faced off against anything like that again. But guys, when building a team you truly can never have enough talent in the trenches. They change everything. They hide issues elsewhere. And they are more reliable to be there and impacting the game in all weather conditions. That team is built to win from start to finish and it starts right here. -Is Blake Bortles good enough? You know what? I think he is. I have never seen what so many people hate about this kid. He won’t ever be mistaken for Aaron Rodgers but then again, neither will Eli Manning. He makes a couple head scratching throws each week, but then again so does Eli Manning. I have always liked his moxie and I see improvement each year. The QB of that team needs to be just good enough, and I think he is. -Because NFL fans are the way they are, Saquon Barkley and the fact NYG has made him the highest drafted running back since 2006 will be over-analyzed each week. The baseless theory that RBs cannot be taken that high and the fact some potential franchise QB’s were available when NYG was on the clock only adds to the notion. I spoke about him earlier but what I liked the most, he adjusted his approach during halftime. He looked just a hair-too-hesitant early on but you can tell he took it on himself to change this offense in the second half. He was the one player getting the team fired up prior to the start of the 4th quarter. Usually you want rookies to improve their approach week to week, year 1 to year 2. He did it at halftime and made a big difference in the second half against the best/fastest/most physical defense in the NFL. -This defense showed a lot of exotic looks and it created stress for the JAC offense in the second half especially. However when all is said and done, they recorded 1 sack and 1 tackle for loss. They need to produce more than that, plain and simple. -I liked how Shurmur adjusted his pass protection in the second half. Adjustments are a huge part of coaching during games, and he did just that. It still wasn’t pretty, but the NYG offensive line was overmatched badly. There isn’t much you can do there but this offense did catch a flow in the second half much thanks to the blocking scheme being slightly altered.